Does the earth shake when you laugh? Do you have the power to move mountains? Do you ever cackle like a goose? If so, then you have a lot in common with Geb, the God who represents our next Ancient Egyptian Zodiac Sign. Characteristics of the Egyptian Zodiac Sign Geb: If your sign is Geb, you are very aware of the feelings and needs of other people. This makes you think before you act and speak. While you have a tendency to be submissive, you can be firm when you need to be. You have to be careful not to be too easily influenced by others. Your humility and sweetness can make it easy for you to be taken advantage of, but this doesn't mean you're a pushover. You are quite protective and your word is your bond. You could do well as a counselor, priest or a writer. 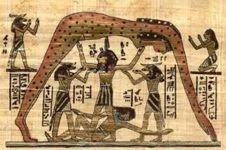 About the God Geb: Geb was the Ancient Egyptian God of the Earth. He made crops grow and his laughter caused earthquakes. He was depicted as a bull, crocodile, snake, and a ram. He was the father of Osiris, Seth, Isis, and Nephthys, and the grandfather of Horus. In another creation story, Geb is associated with the goose that laid the egg, which hatched to reveal the Sun and the Earth. When the Greeks took over Egypt, Geb became connected with the Titan Cronus, the father of Zeus, Poseidon and Hades. Thus altering his position as an Ancient Egyptian Zodiac Sign.